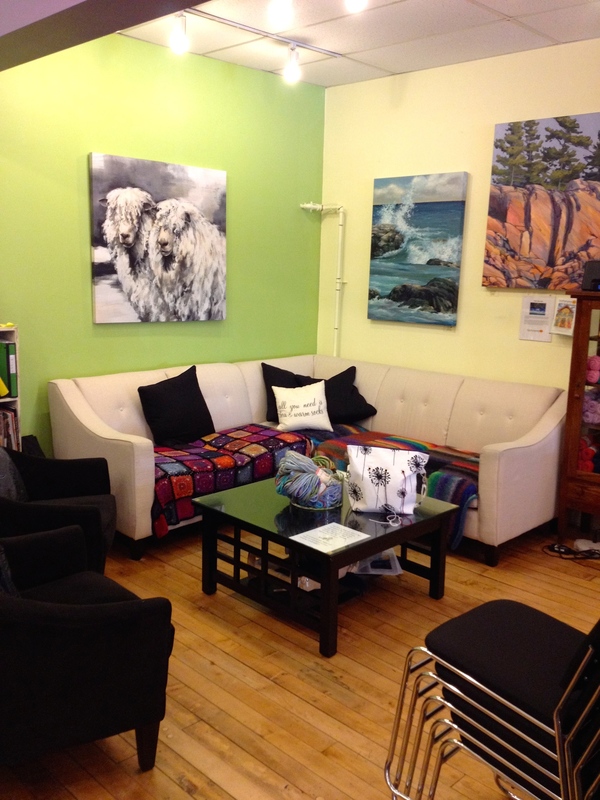 Ever since I began this obsessive fibre arts period of my life, I have enjoyed visiting local yarn shops when I travel. I have to say though, that over time, I have been able to somewhat shorten my visits … well… depending on how talkative the shop owner is! Part of the reason for this is that I like to look for local items when I travel. I visit the local yarn shop and the moment I enter, I ask if they carry anything made by local artisans. My logic is that, generally speaking, all the other mass-produced yarns can be found near my home. So if I’m going to stuff my suitcase full of lovely skeins to bring back with me, they had better be unique and one of a kind. 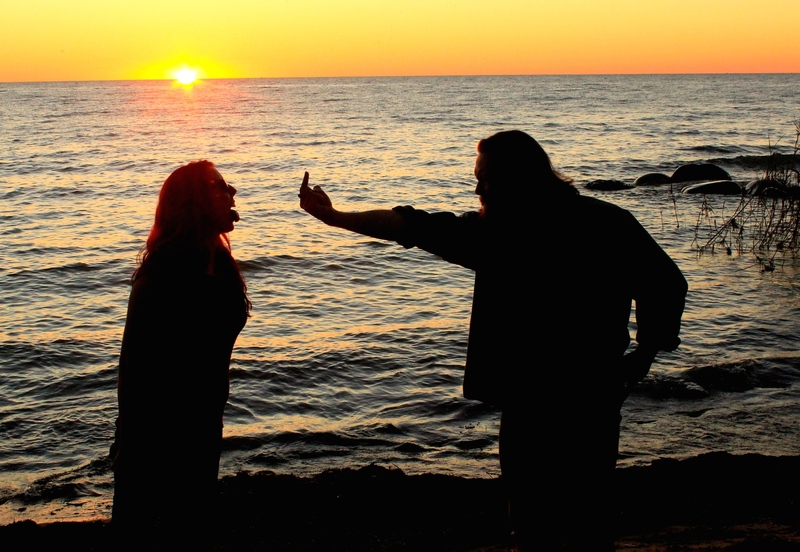 My most recent outing was to Port Elgin, Ontario. We were visiting friends at their cottage and a few of us decided to head out for some needed groceries….and a chai latte! It’s always time for chai! As we drove through the downtown portion of Port Elgin, it occurred to me that perhaps I could convince the driver, our friend John, and B to pop by the local yarn shop….assuming there was one. At a red light, I googled yarn shop + port elgin and came up with Doc Knits. I excitedly mentioned that there was a yarn shop somewhere nearby and could we maaaaaybe go find it. They didn’t open for another half hour so we did the shopping first and then the guys parked the car and gave me some time to poke my head into the loveliness that is Doc Knits. One of the first things I noticed about the shop is the sitting area in the back, beyond the front desk. The second thing I noticed was BUTTONS! 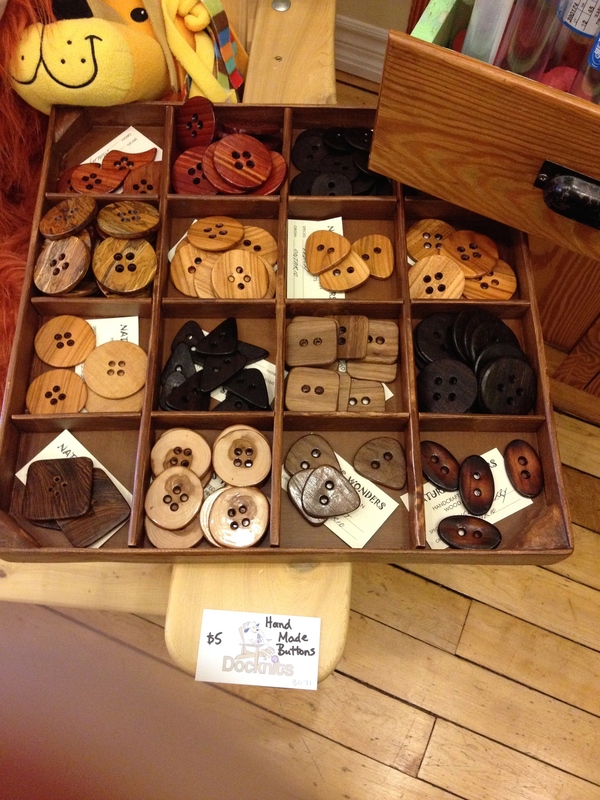 How I LOVE wooden buttons! It was at that point that I stopped looking and headed to the counter to ask about local yarn. The woman working there was lovely and quite friendly, I’m sorry I didn’t get her name. She pointed me in the direction of their ShantiKnits yarn. 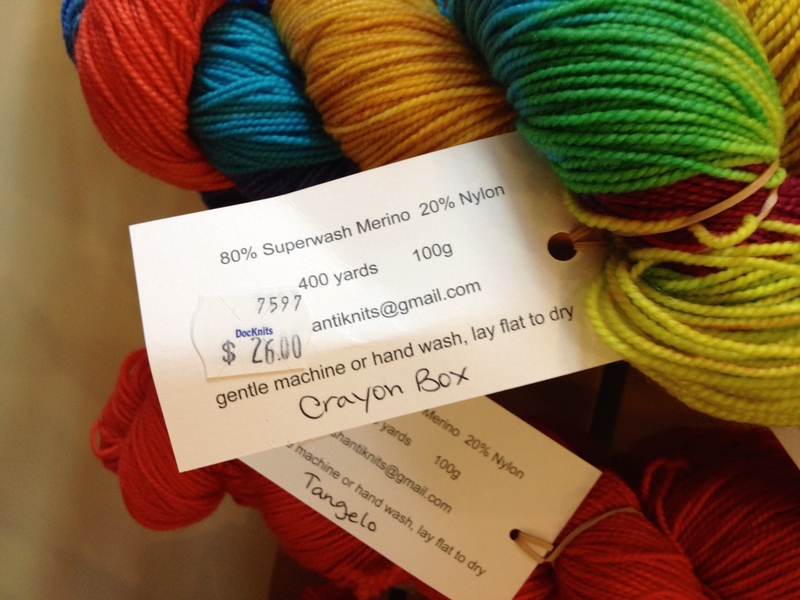 The yarn itself wasn’t local, but the dye job was done nearby in Southampton, Ontario. Good enough for me! I really liked her choice of colorway names! There were many skeins to choose from but I went with Chantry Mist as it seemed to be the most interesting and unique of the bunch. Cannot wait to work with these two skeins! Once I had decided what I would buy…I couldn’t help but look around a bit more. Just to see what they had of course! 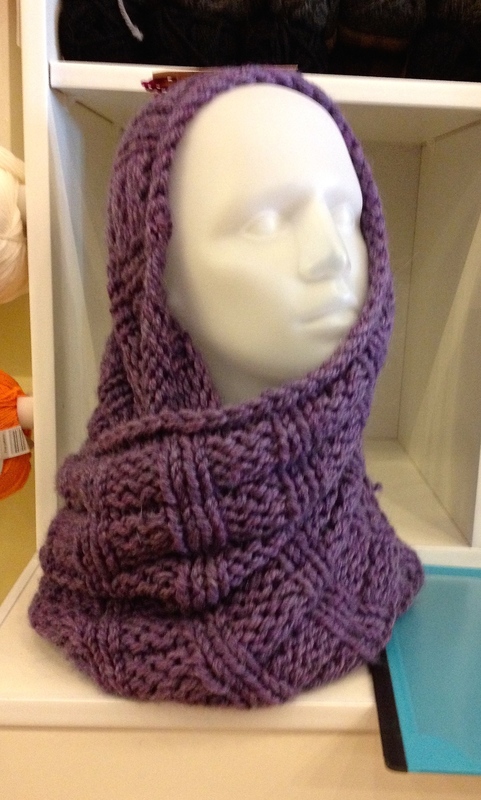 I came across this lovely cowl, which turned out to be a free pattern off Ravelry! I liked the look of it, so I took a shot so I would remember to find it online. 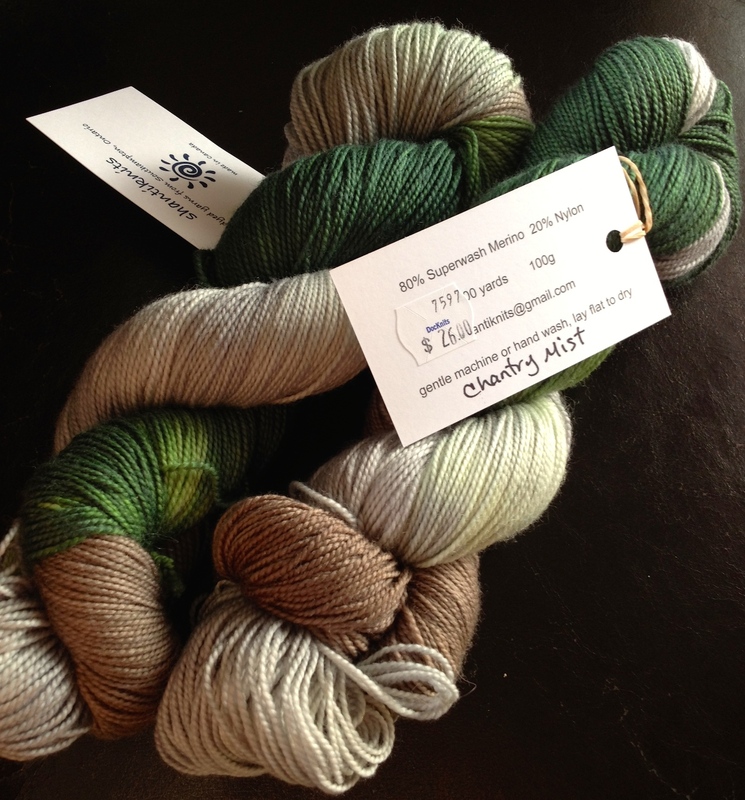 AND the other item I found that excited me was an alpaca/bamboo blend yarn! I am always on the lookout for yarns that are natural fibres, warm, and NOT wool as so many folks who order shawls from me specify that they don’t want wool of any kind. We could get into the discussion about wool and how there are so many different kinds, treated so many different ways that it’s hard to say that all wool is the same: itchy, scratchy, rough, uncomfortable. I absolutely love working with alpaca and I am completely happy to search for an appropriate yarn to make a custom order! 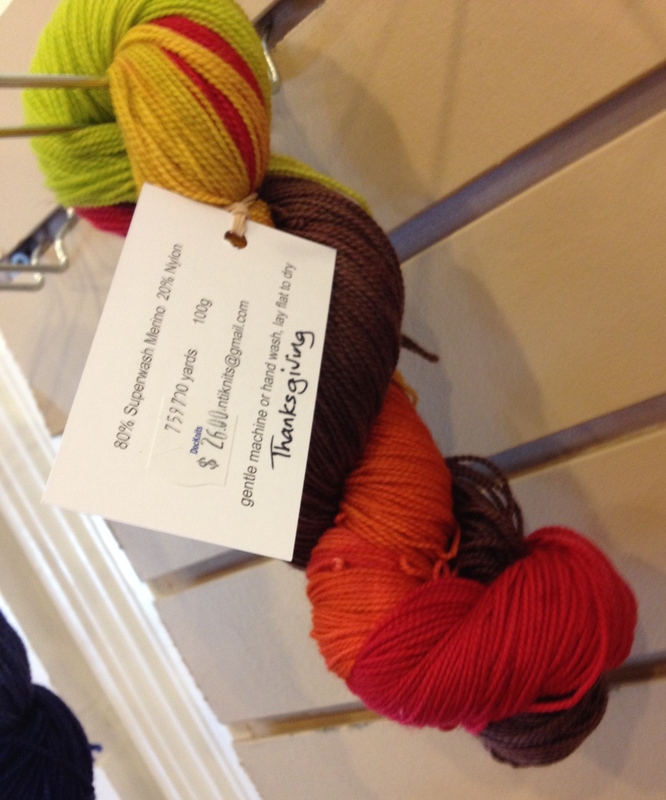 It can be hard to find a heavier weight so this yarn that I came across made me happy! 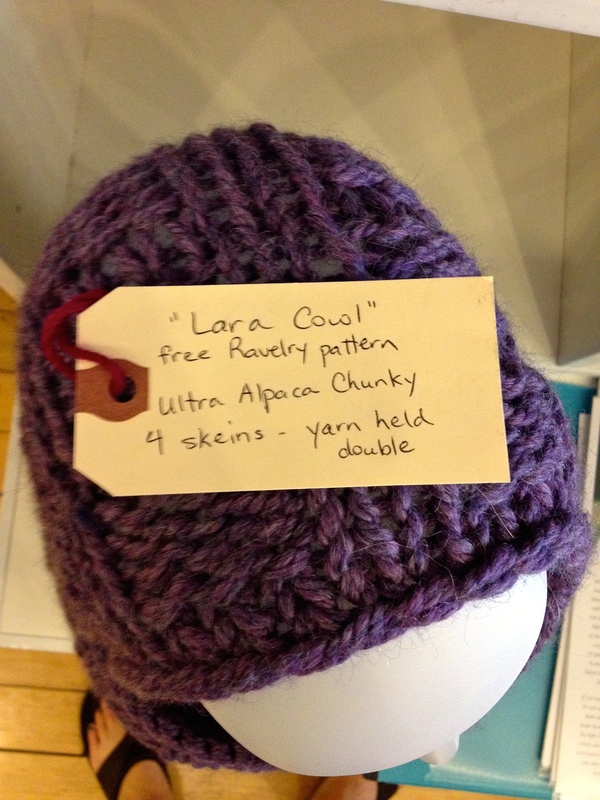 Heavier weight alpaca, wool-free and chain-constructed. Perfect for those heavier winter projects I want to work on! So in the end, I was in the shop for about 15-20 mins and only bought two skeins of locally dyed yarn! That’s a success in my books! What a lovely colorway you chose! I do the same thing you describe. 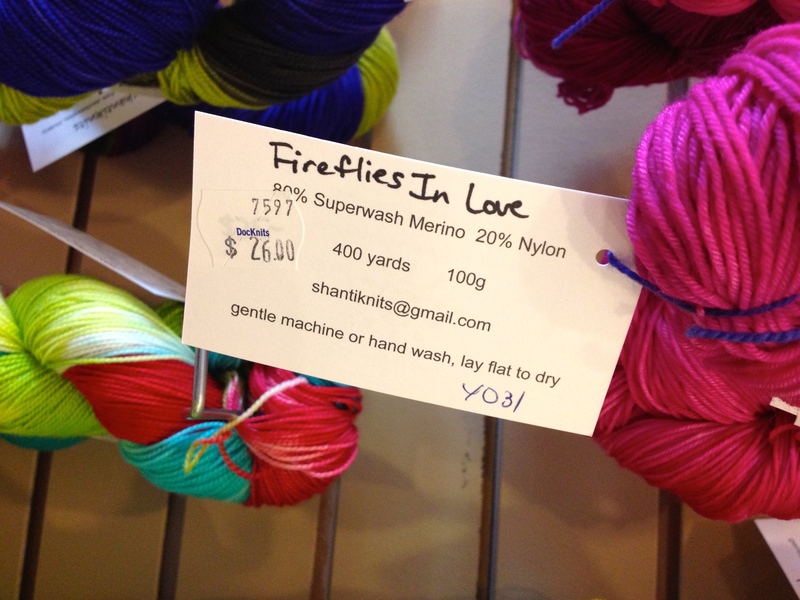 It’s so much fun discovering new yarn stores and locally spun or dyed yarns.